At Event Espresso we’re all about making our customers’ lives easier. We know that your time is precious. That’s why we are excited to announce the stable release of our Infusionsoft Integration add-on for Event Espresso 4. Now, with Event Espresso 4 running on your website, you can push valuable customer data from event registrations on your website straight to your Infusionsoft database. No more copying and pasting data. Did I mention the process is automated? More details and purchase on our sales page! 2. The customer pays for the event using either a built-in Event Espresso payment gateway. 3. The customer is shown a payment confirmation directly on your website. 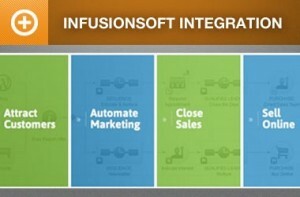 Infusionsoft’s all-in-one sales and marketing software is built to meet the specific needs of small business. With the Event Espresso 4 Infusionsoft integration add-on, you can completely automate your customer relations and email marketing campaigns. Already have the EE3 version? No problem! Existing license holders can take advantage of this tool today, at no extra charge! How do we download this tool if we’re using the EE3 version? You’ll actually download the Event Espresso 3 Infusionsoft add-on (version 1.3.0.p), which is available to download on your account page. The Event Espresso 4 Infusionsoft add-on is compatible with Event Espresso 4 only.